The aim of this review paper is to give an overview of the attempts and developments of photocatalysts for the degradation of volatile organic compounds (VOCs) and water splitting reaction to produce hydrogen gas as alternative energy source. Human requirements are limitless and since time immemorial it is being fulfilled with ingenuity, innovations and inventions. Innumerable items and countless ideas have placed the human life today at the threshold of fantasy and reality where there is hardly a boundary. Because of the technological advancements modern day living enjoys comforts and amenities that were undreamt of by our forefathers. Facilities that were once figments of imagination and limited to science fictions are realities in life today. These innovations have become part of normal life and have also reached the lower rungs of society, even in the developing world. The easy accesses of most of the modern amenities and comforts they provide have become part of life in today’s society because of the mass production and they’re being produced at affordable prices by competitive industries. If science and its endeavors have brought about positive changes in the lives of mankind, human negligence, avarice and apathy have brought about untold miseries and distress in the world. The products that have changed the quality of human lives for better by leaps and bounds, have also caused immeasurable sufferings because of human shortcomings and shortsightedness. Industries that produce essential commodities for human consumption and provide sustenance to many by employment also adversely affect the environment when the nature’s demand for balance is ignored. The end-result being that the communities is compelled to endure the adverse impacts. It has, hence, become essential that a balance be maintained between the production activity and the environment for sustained development. There is a growing concern, particularly within the scientific community, that the rapid release of greenhouse gasses into the atmosphere, associated with use of fossil fuels, may have a serious impact on terrestrial environment. If this concern spreads to the world population in general, factors other than price may come to moderate the mixture of primary energy sources used by humans. Even if this does not come to motivate the actual change, however, the use of fossil fuels at the current rate is an unsustainable practice. While the timing is a subject of intense debate, there is no question that our planet’s fossil fuel reserves are being consumed faster than they are being formed and thus over time the real cost of energy derived from fossil fuel sources must eventually rise. At some point, other fuels derived from ancient sources, and thus even today research is being dome into how the cost of energy so generated might be reduced. Organic Chemicals, which may be found as detrimental pollutants in water and air from industrial or domestic sources, must be destroyed or removed before discharge to the environment. The increased public concern with these environmental pollutants has prompted the need to innovate novel treatment methods with photocatalysis gaining a lot of attention in the field of pollutant degradation. Because of their potential application to the decomposition of pollutants and wastes in air and in water, semiconductor photocatalysts have attracted much recent attention. Among the semiconductors, titanium dioxide (TiO2) has been widely studied because of its high photocatalytic activity. TiO2 is a powerful oxidizer. Light energy from ultraviolet radiation in the form of photons excites the electrons on the surface of titanium atoms, moving them from "the valence band to the conductance band". The result of this energy change is the formation of holes in the surface of the titanium atom, and free electrons which are now available to form hydroxide, superoxide or other radicals, which can oxidize organic chemicals, or reduce metal species. TiO2 powder is added to the solution of a given chemical and exposed to ultraviolet light, either from natural sunlight or commercial lamps. Photocatalytic detoxification process consists on the utilization of the wavelength shorter than 400nm to promote a strong oxidation reaction. This reaction takes place when such UV radiation photoexcites a semiconductor catalyst in the presence of oxygen. In this circumstances hydroxyl radicals which attack oxidizable contaminants are generated, producing a progressive breaking of molecules yielding only to carbon dioxide, water and dilute mineral acids. Initially, the process is able to oxidize almost any chemical substance owing to its very high positive oxidation potential. In general, solids with bandgap energies less than 3 eV are considered to be semiconductors. In a semiconductor the highest occupied and the lowest empty energy bands are particularly important. These two bands are separated by an energy gap called the bandgap. The highest occupied energy band is called the valence band and the lowest empty energy band is the conduction band. Semiconductors can be made conductive either by putting extra electrons into the conduction band or by removing electrons from the valence band. Removal of an electron from the valence band creates a positively charged vacancy called a hole. The hole can be regarded as the mobile entity because annihilation of a hole by a nearby electron effectively moves the hole over in space. So electrical current can be carried by either electrons in the conduction band or holes in the valence band, or by both type of charge carriers. Mobile charge carriers can be generated by three different mechanisms. Thermal excitation, photoexcitation and doping. If the bandgap energy is sufficiently small (less than half an electron volt) thermal excitation can promote an electron from the valence band to the conduction band. In a similar manner, an electron can be promoted from the valence band to the conduction band upon the absorption of a photon of light, photoexcitation, provided that hn>Ebg. Doping: Doping is the process of introducing new energy levels into the bandgap. Two types of doping can be distinguished. For n-type doping, occupied donor levels are created very near the conduction band edge. In this case current is carried mainly by negative charge carriers. Similarly P-type doping corresponds to the formation of empty acceptor levels near the valence band, creating positive charge carriers. In this particular case current is carried mainly by positive charge carriers. Hydrogen is currently produced from fossil fuels on an industrial scale. However, much more attention has been focused on the direct splitting of water for H2 production. Fujishima et al. (1971) studied the photocatalytic decomposition of water using several semi-conducting oxides such as TiO2, SrTiO3, K4NbO17, BaTi4O9 and NaTaO3. Zou et al. (2000) reported that InTaO4 could evolve H2 gas from pure water under visible light irradiation but the activity is very low, and have claimed of novel photocatalyst, In0.8 M0.2TaO4. Despite more than three decades of significant heed on research and development of Hydrogen from water, the best photocatalystic materials have high production costs, poor lifetimes, low efficiencies or non-stoichiometric splitting of water. An efficient photocatalyst is needed for the technology to work. Although there has been remarkable progress in the past decades for photocatalysts working under UV-light, this technique has rarely been extended to visible light. The first requirement for visible light-induced photocatalyst is the proper band gap energy. There are only a few materials of photocatalytic activity satisfy this condition such as CdS, WO3 and Fe2O3. Although CdS is a good candidate for photocatalytic water reduction, it has a fatal photocorrosion problem as CdS itself is oxidized by photogenerated hole. Kudo et al. (1998) reported some CdS-based photocatalysts modified by Cu-ZnS or Ni-ZnS over which H2 was produced from water in presence of sacrificial agents such as Na2S and methanol. Hwang et al. (2002) recently synthesized MgO doped WO3 photocatalyst and reported Mg-doped WO3 (Mg = 5-10 wt%, band gap energy = 2.6 eV) as a novel non-sulfide visible light-induced photocatalyst over which H2 evolves photocatalytically (3.0 mmol/h) in the presence of a sacrificial agent. 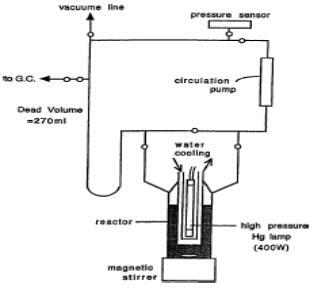 The Photocatalytic reaction was performed using a glass-made close gas circulating system with inner irradiation quartz reactor as shown in figure 1. The light source was a 400 W high-pressure Hg lamp covered with a quartz jacket. A reaction mixture was prepared by introduction of TiO2 (P-25), H2PtCl6 (Pt: 0.3 wt% to TiO2) and prescribed amount of an additive such as carbonate into distilled water in the quartz reactor. Then this mixture can be mixed well using a magnetic stirrer and deaerated thoroughly by the introduction of Ar-gas. The first run was started by irradiation and evolution of H2 and O2 was detected by a on-line gas-chromatograph and a pressure sensor. Arakawa et al. (2000) discovered by chance that Na2CO3 addition to a Pt/TiO2 suspension significantly promotes stoichiometric photo-decomposion of water. This procedure is also applicable to many other photocatalyst such as M/TiO2, M/Ta2O5, M/ZrO2, M/SrTiO3 etc. (M = metal or metal oxides). They performed various experiments with or without additive. In case of no additive a small amount of H2 was evolved but O2 was not observed. With the additive of sodium salt eg. NaOH, NaCl, Na2SO4, Na3PO4, NaHPO4; the H2 evolution rate slightly increased than that of no additive and evolution of O2 was not observed over long time in the former case also. On the other hand upon the addition of Na2CO3, the H2 evolution rate increased dramatically with the production of Oxygen in stoichiomeric ratio. The production of H2 and O2 was not observed in the presence of non-carbonate salts such as Na3PO4 & NaHPO4 and under the various pH values. Therefore, the concentration of carbonate ion (CO32-) or bicarbonate ion (HCO3-) is essential for splitting of water over Pt/TiO2 rather than pH of solution and the Na+ cation. Figure 1. A glass-made closed gas-circulating system with an inner irradiation quartz reactor (Ref. Arakawa et al., 2000.). Figure 2 shows the proposed reaction scheme over Pt/TiO2 in water. Many side-reactions such as (i) back reaction on Pt metal to form H2O from H2 and O2, (ii) photo-adsorption of O2 and surface peroxide formation, and (iii) recombination of electron holes, take place over the Pt/TiO2 surface in carbonate-free solutions. The role of carbonate salt, fortunately, is to suppress the back reaction by modifying the Pt-surface. Most of the holes initially react with carbonate anions on the surface and carbonate and bicarbonate radicals are formed. By coupling of two radicals, peroxycarbonates are formed and then these peroycarbonates are easily decomposed into O2 and CO2 by holes under irradiation. Figure 2. 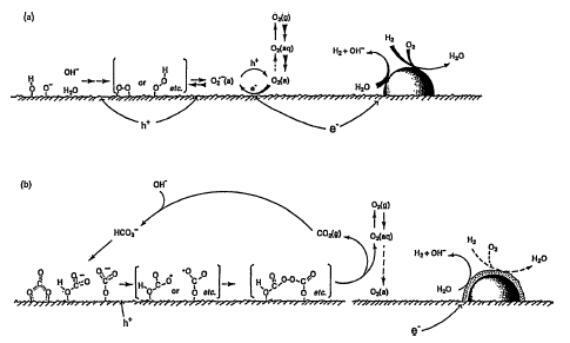 Proposed reaction scheme over Pt/TiO2: (a) in water and (b) in an aqueous carbonate solution (Ref. Arakawa et al., 2000). Depositing or incorporating metal ion dopants into the titanium dioxide particles can influence the performance of these Photocatalysts. This affects the dynamics of electron-hole recombination and interfacial charge transfer. The largest enhancement of photoactivity through doping was found in nanosized particles, in which the dopant ions are located within 1-2 nm of the surface (Choi et al., 1994). From table 1, we can observe that Nickel Oxide plays good role to enhance the photocatalytic activity. The band structure of oxides is generally defined by d-level and O 2p-level of oxides. The band structure of NiO, however, is assigned to Ni 3d8 and Ni 3d9. This means that the Ni-3d level in the Ni-doped catalyst may form a new level in the band structure and hence the Ni-doped photocatalysts can utilize a wider spectral region of light irradiation than non-doped photocatalysts (Zou et al., 2001). Kato et al. (1999) studied the decomposition of pure water into H2 and O2 over NiO-doped-NaTaO3 photocatalyst. It has been found that the photocatalytic activity was much increased by the NiO loading. 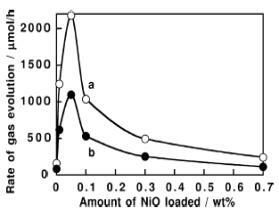 The optimum amount of NiO was more than 0.05 wt%. The excess amount of NiO shields the irradiated light (since NiO is gray color) and covers the NaTaO3 surface resulting in the decrease in photocatalytic activity in the region (figure 3). Similar results reported by Ko et al. (2002). They reported Ni-loading on Sr4Ti3O10 enhanced the photocatalytic activity. The highest activity (H2 evolution rate of 170 mmol/h) was achieved when 2.7 wt% of Ni was loaded by vapor deposition (VD) using Ni(acac)2 on Sr4Ti3O10. Kudo et al. (1998) studied the photocatalytic O2 evolution from aqueous solution containing Ag+ as an electron scavenger under visible light irradiation on BiVO4 with a 2.3 eV band gap. This group compared the photocatalytic evolution between WO3 and BiVO4. Although the photocatalytic activity of BiVO4 was lower than WO3, the wavelength region for BiVO4 is wider than that for WO3. The Niobium and Zirconium oxides such as K4Nb6O17, NaTaO3 and ZrO2 can decompose pure water without co-catalyst loading and any additive in the water (Ko et al.2002). Figure 3. Dependence of Photocatalytic activity for decomposion of pure water over NiO/NaTaO3 upon the amount of NiO loaded; (a) H2 (b) O2; Catalyst: 1 gm, distilled water: 350 ml, light source: 400 W high-pressure mercury lamp; reaction cell: inner irradiation quartz cell (Ref. Kato et al., 1999). Nanocrystalline potocatalysts are ultrasmall semiconductor particles which are a few nanometers in size. The band gap of the semiconductor becomes larger with decreasing particle size, and is indicated by an adsorption shift to shorter wavelength (Henglein, 1997). Nanosized semiconductor particles, which exhibit size-dependent optical and electronic properties, are called quantized particles (Q-particles) (Kamat, 1995). One of the main advantages of the application of Q-sized particles is the increase in the band-gap energy with decreasing particle size. As the size of semiconductor particle falls below the critical radius, the charge carriers begin to behave quantum mechanically and the charge confinement leads to a series of discrete electronic states. As result there is an increase in the effective band gap (Hoffmann et al., 1992). Zou et al. 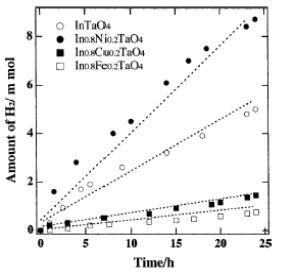 (2001) found that the formation of H2 on In0.8M0.2TaO4 was about 180% that of non-doped InTaO4, while formation rates on Cu and Fe doped InTaO4 photocatalysts are much lower (figure 4). Figure 4. Photocatalytic H2 evolution on the In0.8M0.2TaO4 (M = Ni, Cu, Fe) compound from Pt/CH3OH/H2O solution under UV irradiation (Ref. Zou et al., 2001). The evolution of CO gas (table 2) originates probably from decomposition of formaldehyde, an oxidation byproduct of methanol. The band gaps of InTaO4 and In0.8M0.2TaO4 were calculated to be 2.6 and 2.4 eV from the diffuse reflection spectra. This means that Ni-doped photocatalyst can utilize a wider spectral region of light than non-doped one. Bet measurement showed the surface areas of In0.8M0.2TaO4 and InTaO4 are 0.97 and 1.35 m2/g, respectively. This is almost 1/50 of surface area of TiO2 photocatalyst (53.8 m2/g). Since the photocatalytic reaction process occurs on the photocatalyst surface, the increase of the surface area for the photocatalysts might lead to the increase of their photocatalytic activity under visible light irradiation. Considering the topics covered in this review article, it is evident that Ni-doped photocatalysts have higher photocatalytic activity on degradation of VOCs and splitting of water and evolution of hydrogen gas from water. - Zou Zhigang, Jinhua Ye and Hironori Arakawa, Catalysis Letters, 75, 3-4 (2001) 209-213. - Zou Zhigang, Jinhua Ye, Ryu Abe and Hironori Arakawa, Catalysis Letters, 68 (2000) 235-239. - Kudo Akihiko, Zhigang Zou, Jinhua Ye, Kazuhiro Ueda, Hideki Kato and Ikko Mikami, Catalysis Letters, 53 (1998) 229-230. - Hwang Dong-Won, Jindo Kim, Tae Jin Park, and Jae Sung Lee; Catalysis Letters, 80, 1-2, (2002) 53-57. - Kato Hideki and Akihiko Kudo, Catalysis Letters, 58 (1999) 153-155. - Ko Young-Gwan and Wha Young Lee, Catalysis Letters, 83, 3-4 (2002) 157-160. - X. H. Xu, M. Wang, Y. Hou, W. F. Yao. D. Wang, H. Wang, J. of Materials Science Letters, 21 (2002) 1655-1656. - Fujishima A., and K. Honda, Bull. Chem. Soc. Japan. 44 (1971) 1148. - Choi W., A. Termin, and M. R. Hoffmann, The J. of Physical Chemistry, 98 (1994) 13669-13679. - Henglein A., Physical Chemistry 101 (11) (1997) 1562-1572. - Kamat P.V, Chemtech, (1995) 22-28. - Hoffmann A. J, G. Mills, H. Yee and M.R. Hoffmann, The J. of Physical Chemistry, 96 (1992) 5546-5552. - Arakawa Hironori and Kazuhiro Sayama, Cataysis Survey from Japan 4 (2000) 75-80.